This section mirrors the order of codes in the code list and displays any uncoded transactions for your attention. If there are any uncoded bank transactions in Cash Manager Focus they will appear at the top of the section for you to identify and code or correct in the Actuals screen. Until they have been coded or corrected they will remain at the top of the Analysis by code section and won't be included in the total calculations. 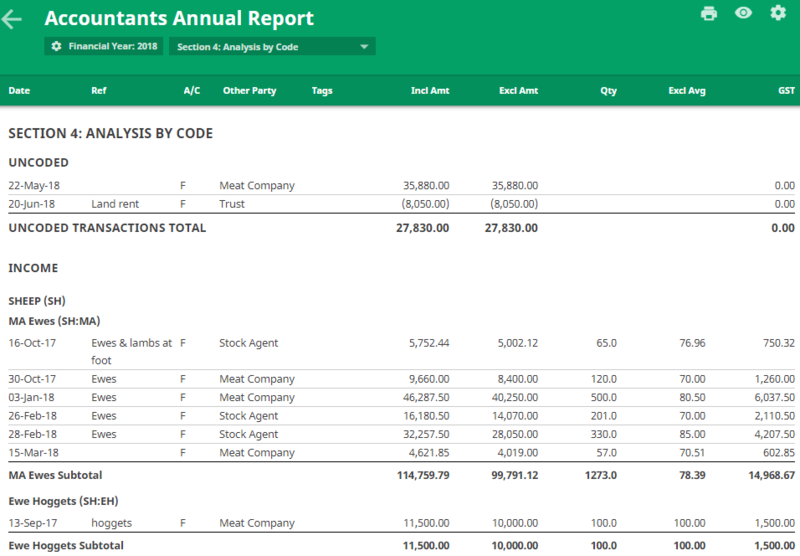 For example, in the image below, a livestock sale and a land rental transaction are uncoded, so are excluded from the Income section (livestock) and the Interest and Rent section (land rental) of the Analysis by code. It also takes into account all closing paid accounts payable and closing paid accounts receivable that have been recorded in Cash Manager Focus.